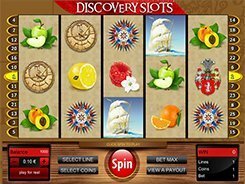 Discovery is a Gamescale-developed adventure-themed slot equipped with 5 reels and 25 paylines. The game features a wild, and a bonus symbol. You may adjust the number of paylines you want to have in play, and a bet line that varies from $0.01 to $5, so you may place a bet anywhere from as low as one cent up to $125 per spin. A wild symbol represented by the Gold Coin stands in for all regular symbols and pays out the slot’s second largest prize of $30,000 if you match five of them on a payline. The first and third largest jackpots you may win in the game are $37,500 and $7500. 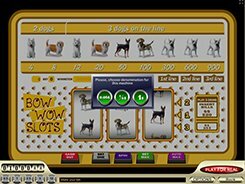 The slot has a bonus feature known as the Treasure Bonus that starts when three or more symbols that look like a compass dial occur on the reels. On the second screen you are presented with the World Map marked with crosses, and your task is to pick the crosses until you reveal a skull-and-crossbones symbol that ends the feature. Every successful pick awards you a random amount of coins. Overall, Discovery will take the fancy of low- to mid-rollers and the players who like adventure-themed video slots. PLAY FOR REAL MONEY!